This is an extract from my travel book which has the working title The Birdwoman of Bangkok and Other Tales: Singapore to London Overland. The cyclo driver who took us on a late-afternoon tour of Ho Chi Minh City’s back streets had four teeth, wore a ‘STEPS Musicband’ T-shirt, and referred to Steve as Man. Not in a hippy way, like “Hey man”, but as though Man was Steve’s given name. He complimented Man on his choice of woman – “She is very good” – then proceeded to shout the same incomprehensible stories over and over into Man’s hurting ear while pedalling us through quiet lanes of shops that sold broken clocks. “Help, he’s giving me a headache,” Steve whispered. “YES, and my friends come back London one week, then go back one week. London friends come back one week,” shouted Mr Steps, for the third time. In the throes of his excitement, he kept forgetting to steer the cyclo. “We’re going to die,” I said. Soon his ramblings gave way to a commentary of his own devising. The poor guy needed help, but that didn’t excuse him from trying to charge us double at the end of the ride, claiming our agreed fare was for one passenger only. Fortunately Man and I were well-versed in cheeky scams by now, and handed over the pre-arranged money. The cyclo driver argued only gently, and we left him scratching his belly through the STEPS T-shirt and grinning a gappy grin. Walking back to the hotel as dusk was falling, clouds stretching like pulled grey wool across the sky, we saw families kicking up their da cau in the park, while children too little to join in wobbled around on toy-shop trikes. 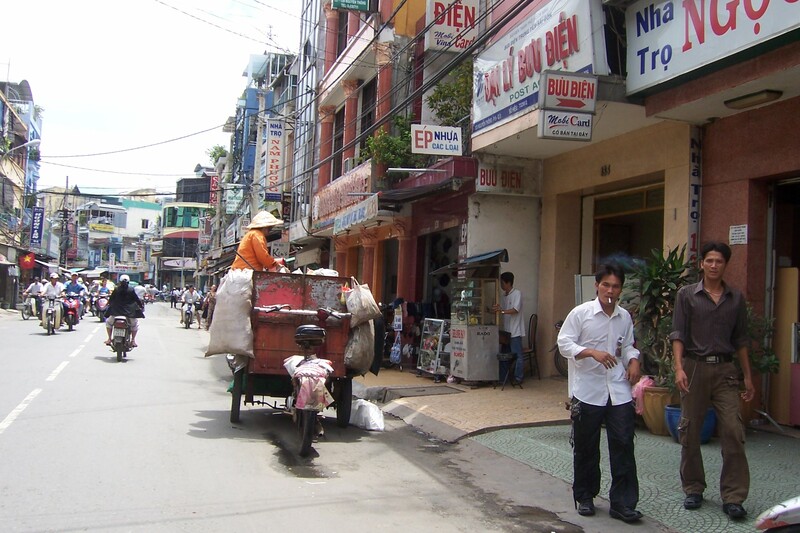 We took a shortcut down an alley and were transported into my vision of old Saigon: laundry sagging on lines from window to open window; wrinkled ladies squatting down to chop food on the pavement; a brass funeral band playing a racket outside a mourning household where candles burned on the porch. I love this. I think it’s really skillful how you capture and retell a moment without the deadening effect of too much reflection/interpretation. I like it because you can’t see the strings. Very engaging. Thank you for your kind words, George. I value your opinion, as (I hope) you know, so your comment has made me smile. Thank you, Sue – kind words indeed! Will keep you posted.